The blocks are made two-at-a time, beginning with two large squares. WHITE – may be solid or a white-on-white (WOW) print fabric. If you make multiple pairs of lotto blocks, you may use the same white fabrics for ALL your blocks. CONTRAST – may also be a solid or TOT print fabric that reads as solid. You’ll want to choose a fabric that will create a strong contrast. Bright colors and medium-to-dark jewel tones are good choices. If you make multiple PAIRS of blocks, you must use a unique contrast fabric in each pair. Please DO NOT USE multicolor prints for your July Lotto blocks. We want to create blocks with a graphic impact and strong contrast. Since we will be making PAIRS of blocks, the MAXIMUM number of blocks you can make for chances in the drawing is FIVE PAIRS. Remember, you may use the same white (solid or White-on-white print) for all your blocks, but the contrasting fabric for each pair must be unique. 4 or 5 PAIRS of blocks, you’ll split up the pairs and mail to THREE WINNERS, sending no one matching pairs of blocks. 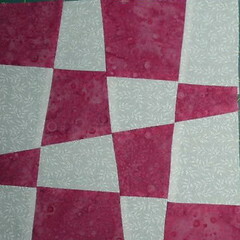 I’m changing things up for this block so that the winners will receive as many different fabrics/colors as possible. When making these blocks, everyone will begin with two 10-inch squares, but the resulting block size will differ depending on the angles of your cuts. For this month/block ONLY, I am asking that no one trim or square up their blocks … and allow the winners to trim them all to a common size OR be “liberated” and design with the different sizes of blocks she (or he) receives. Remember DO NOT TRIM your blocks this month. Here’s a look at how 35 liberated checkerboard blocks randomly arranged might look–with block photos from sneak peekers Béa, Cathy, Cheri, Ginny, Jennifer, Julie, Kate, Kathie, Linda, Linnea, Mary Jane, Michelle and Toni. Thanks to everyone for the great block photos that made this virtual quilt possible. These blocks look great, I am excited to try them! This looks like it is going to be such a BLAST to make! Can't wait to get started!